MANCHESTER — Manchester City manager Pep Guardiola highlighted Raheem Sterling’s growing self-belief after his remarkable run of late goals continued with a superb stoppage-time winner in the 2-1 victory over Southampton. City’s quest for a 12th successive league victory seemed to be over when Oriel Romeu’s 75th-minute equaliser for the Saints cancelled out Kevin De Bruyne’s goal early in the second half at the Etihad Stadium on Wednesday. But in sixth minute of added time Sterling curled a brilliant shot into the top right-hand corner, sparking delirious scenes among City’s fans, with Guardiola running onto the pitch in celebration. City’s last three victories have all been courtesy of late strikes from 22-year-old, who scored in the 88th minute against Feyenoord last week, the 84th against Huddersfield Town before his winner in the dying seconds against Southampton. "Before, he didn’t believe. Now, he can do that, said Guardiola. "In the end, he had the personality to make the action, to put the ball there in the angle. It was a real fantastic goal." 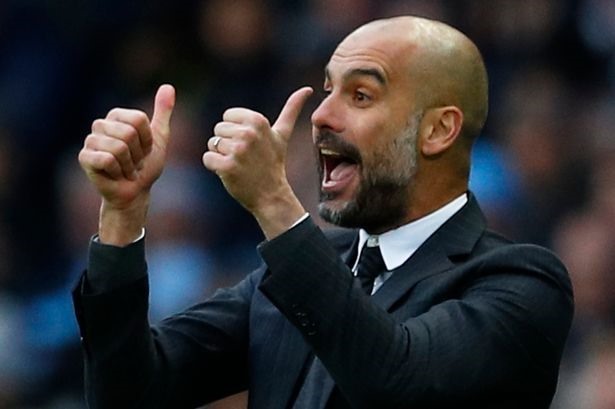 Guardiola may land in trouble with the Football Association if referee Paul Tierney reports his dash onto the field following Sterling’s winner. "I apologised to the referee," Guardiola told reporters. "He said ’you can’t go there’ and I said ’I know!’. "I said ’I apologise’, I couldn’t control it. I was so happy, like all the fans, all the players. I wanted to run behind ’Rash’ (Sterling) but I’m not fast enough! ", the former Barcelona and Bayern Munich manager added. The scenes that greeted Sterling’s third consecutive winning goal seemed excessive for a routine Premier League fixture. City players sprinted to the far corner to continue their celebrations, with injured French full-back Benjamin Mendy, sidelined with a cruciate knee ligament injury, even hobbling half the length of the field from the bench to join in. "Mendy’s crazy! He has a six-month injury and he’s running. Disaster!," joked Guardiola. The celebrations also continued in the home dressing room afterwards, with players posting images of the scenes on social media. With the Manchester derby at Old Trafford looming a week on Sunday, restoring their lead over United to eight points was hugely important to Guardiola’s men. "You have to enjoy these situations, you never know what will happen in the future," the City manager explained. "We want to win the league but you have to celebrate when you score in the last breath like that. "What impresses the most is the heart with which they play. What happened in the locker room was amazing." Meanwhile Guardiola made light of an angry verbal exchange with Southampton winger Nathan Redmond immediately after the final whistle which the City boss attributed to the visitors "time-wasting". "I was telling him how good a player he is," Guardiola insisted. "Last season he destroyed us here and I didn’t know him. Today, he could not attack because they defended all the time. "Southampton have some super-talented players, Redmond is so good one-against-one. But they didn’t want to play, they were time-wasting from the ninth minute." Southampton manager Mauricio Pellegrino, who once played in the same Barcelona side as Guardiola, was unimpressed by the amount of time added at the end of the match, although he was restrained in his complaint.